This is similar to the weight chart for boys having information against the height. 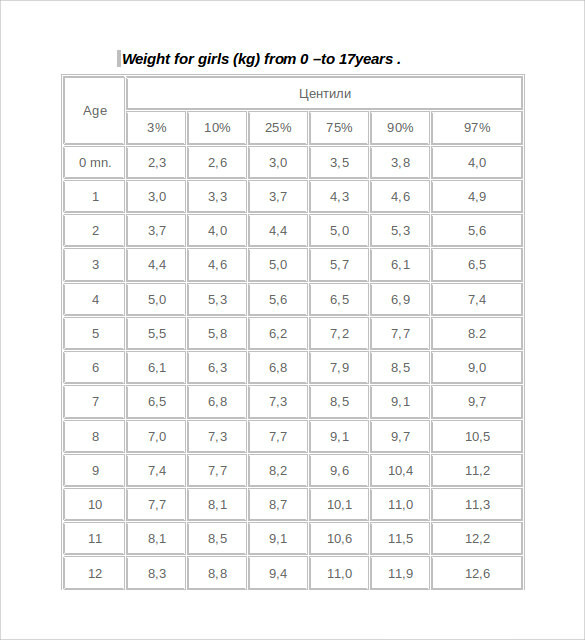 Weight chart for girls provides ideal weight information required for the height the girl carrying. Girls carry an ideal weight as per the height they have and are quite different from boys. Girls generally wonder about their weight right from the young age. So by using this Chart Templates they can know the exact weight they should carry with the height they have. If you are too worried about your weight then get this weight chart. With chart, girls can work on their weight accordingly for better health. 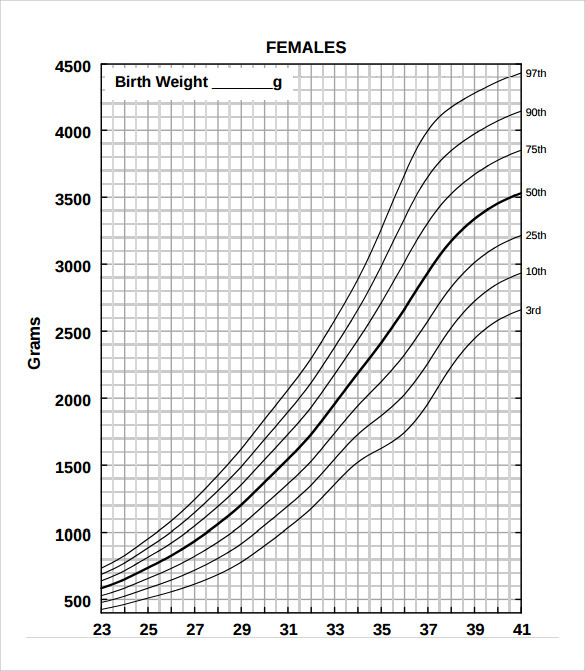 Girl’s weight chart helps to determine the baby’s weight according to the age. This template is easy to download and use in a word or PDF formats. This template shows a graphical representation of weight versus age or birth days. Downloadable girl’s weight chart template is a well layout template that showcases a graphical representation for the height, weight and age. User can calculate whether their child is healthy by checking with the proper height and weight which is accurate for that age. With the help of weight chart doctors and parents can get to know what the child actually needs for proper nourishment. 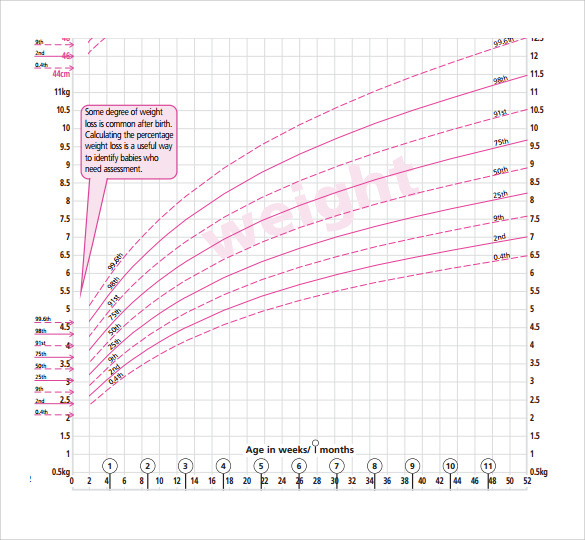 This template shows a graphical representation of age versus weight graph which helps in calculating the proper weight strategy for the child. 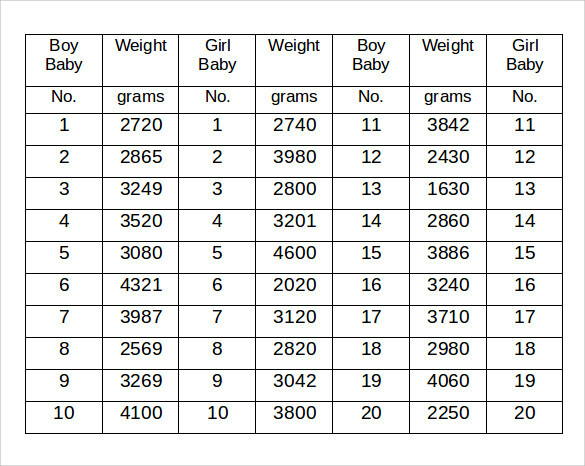 Sample girl’s weight chart template is designed especially for new born babies. Parents and doctors can use this chart to determine whether the baby has attained proper height and weight for that age. This template can be easily downloaded and used. Why is Weight Chart for Girls Templates Needed? With the help of a weight chart the doctor will know whether the baby is growing according to the data present in the chart. For a girl baby the growth pattern is completely different as the weight and height will be lesser and different than that of a boy child. When is Weight Chart for Girls Templates Needed? When a baby is born, proper care and nourishment must be given. 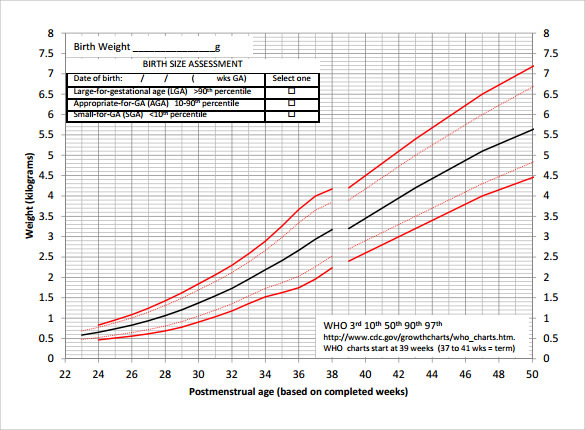 The best way to track a baby’s health is by using a weight chart as it will determine the growth of the baby. Parents can keep a track of the growth pattern of their baby adequately as the time passes. 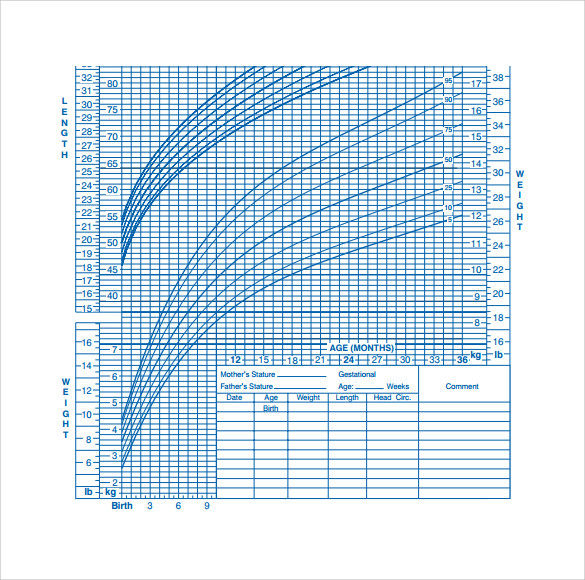 The chart can determine the babies health condition if the babies height and weight fits into the weight chart pattern. These templates are user friendly which helps in showcasing the weight, height and age of the baby which can help the parents to determine their child’s health condition. 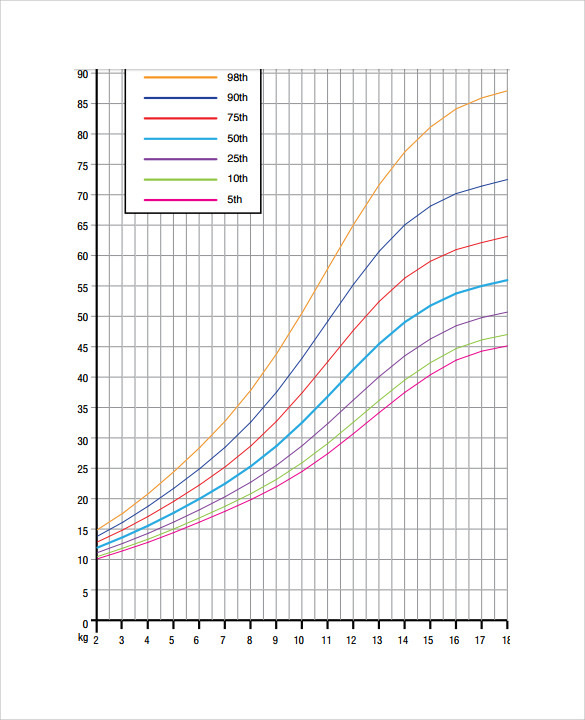 The growth curve and the percentile are determined using this chart which helps the doctor to guide the parents about their child’s growth. The rate of growth of height and weight of a child are not constant they can grow randomly, a weight chart can be used as a guide to help the children’s. Choose the best weight chart templates for your girl child and help her grow with proper nourishment and health. All these templates are user friendly which can be easily downloaded in a word or PDF formats. Design a best weight chart template for your child and assist her to gain a proper weight and height for that particular age.